In 1937 a large triangular site on Queens Road in Clifton, a hundred yards uphill from the landmark Victoria Rooms became the site of the first large-scale luxury block of flats built in Bristol. Of plum-red brick with white stucco details and Crittall windows, it is of a type that in London became the characteristic form for some areas. Not so often perhaps a dramatic arrow-shaped example with a feature balcony on the top floor. In Bristol such buildings are much less common and Queens Court was presented to the public as a new and editing concept. This is another building that has come to my attention partly because of researching the Bristol furniture manufacturer P E Gane Ltd. Director Crofton Gane had employed Bauhaus furniture designer and architect Marcel Breuer in 1935-6 and worked with him on several major projects including remodelling and furnishing his own house and making all the Breuer furniture for the Ventris Flat in Highpoint. Breuer joined Walter Gropius in the USA later in 1936 and Gane cast around for another prominent interior designer/architect to work with. This time it was the New Zealander Wells Coates. 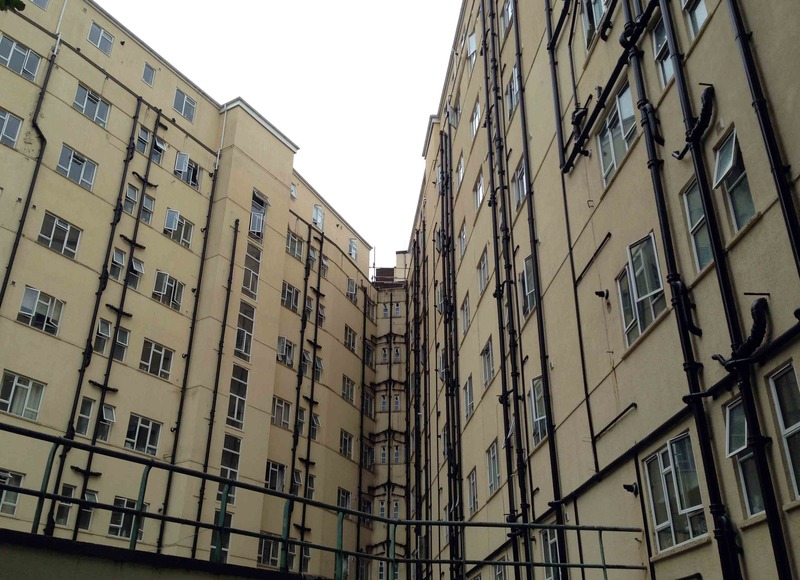 Queens Court was designed by Alec French and is an eight-storey V-shaped block of 74 one, two and three-bed flats, the larger more luxurious ones at the prow. Twenty balconies along the sides are each shared by two flats and contribute to an ocean-liner look. On the ground floor of the main Queens Road frontage a row of small shops offered a use range of services. Within the V a garage provides parking for residents. Uniformed porters, fitted kitchens with refrigerators and electric lifts were provided. A two-bed flay cost £150-200 p.a. and the penthouse £350. Queens Court was promoted as offering a luxurious new style of living and Gane’s were contracted to furnish show flats. Wells Coates was a leading proponent of flats as the future of urban living and was interested in designing unitary furnishings to go alongside them. He had already designed the interiors of the Lawn Road flats in Hampstead for Isokon where Walter Gropius and others had been living. Gane would have been a guest there and would have been very familiar with Coates’ work. He had previously recruited Marcel Breuer as a designer and chose Coates as a fitting new figure to maintain his company’s design credentials. Crofton Gane had two ranges of unitary furniture designed in the early 30s by the companies own designer J P Hully. The idea that a fixed range of adaptable components could be combined to furnish a home was a popular new concept in the 30s and is the parent of IKEA today. For Billy, read FIT-IN No. 5. Wells Coates was commissioned to provide a new range which was based on the Lawn Road designs and named Flexunit. The new pieces included built in electric fires and double-sided island units. A show flat built in the College Green shop was then presented both as a showcase for the new range and also as a prequel to the show flats at Queens Court. Queen’s Court has had a varied history since the 30s and been quite run-down at times. A recent refurbishment has given it some of its dignity back. The little row of shops underneath still thrives. The pergola on the end of the penthouse has gone but the Crittall windows are still intact to give it the classic look. Wells Coates as an architect and designer is less well known than he should be and his involvement with Crofton Gane and in Bristol needs more research. The Cresta Silks shop on Park Street, destroyed in 1940 is another of his projects. For more on Wells Coates see Farouk Elgohary’s 1966 PhD thesis ‘Wells Coates and his position in the Beginning of the Modern Movement in England.’ Thanks to Chris Yeo our Curator for the photos of the Queen’s Court brochure and for drawing my attention to it. The Ken Stradling Collection has examples of J P Hully’s unitary furniture (including FIT-IN No.5) as well as other P E Gane furniture from the 1930s. This post is a revised version of one posted on my blog Clay and Fire. This entry was posted in Architecture, Breuer, Furniture, Interior Design, Modernism and tagged Alec French, Bristol, Crofton Gane, Design, Furniture, Marcel Breuer, Stradling Collection, Twentieth century, Wells Coates. Bookmark the permalink.